ISLAMABAD, Pakistan -- The death toll from a massive suicide bombing targeting Christians gathered on Easter in the eastern Pakistani city of Lahore rose to 70 on Monday as the country started observing a three-day mourning period following the attack. Meanwhile, in the capital of Islamabad, riots erupted for a second day when extremists who have been staging a protest since Sunday surged toward the Parliament and other key buildings in the city center. The demonstrators set cars on fire, demanding that the authorities impose Islamic law or Sharia. The army was again deployed to subdue the rioters. 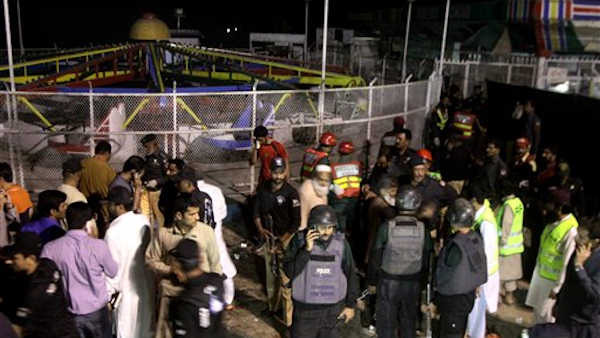 The Lahore bombing, which was claimed by a breakaway Taliban faction that has publicly supported the Islamic State group, took place in a park, crowded with many families with children celebrating the holiday on Sunday. Many women and children were killed and at least 300 people were wounded. The attack underscored both the precarious position of Pakistan's minorities and the fact that the militants are still capable of staging wide-scale assaults despite a months-long military offensive targeting their hideouts and safe havens in remote tribal areas. Ahsanullah Ahsan, a spokesman for the breakaway Taliban faction, Jamaat-ul-Ahrar told The Associated Press late Sunday that the suicide bomber deliberately targeted the Christian community celebrating Easter. Ahsan said the attack also meant to protest Pakistan's military operation in the tribal regions. Even though the bombing targeted mainly Christians, most of those killed in Lahore were Muslims, who were also in the park on Easter Sunday. Of the dead, 14 have been identified as Christians, according to Lahore Police Superintendent Mohammed Iqbal. Another 12 bodies have not yet been identified, he said. In Islamabad, the protesters marched into the city on Sunday in protest against the hanging of policeman Mumtaz Qadri in February. Qadri was convicted for the 2011 murder of governor Salman Taseer, who was defending a Christian woman jailed on blasphemy charges. Taseer had also criticized Pakistan's harsh blasphemy laws and campaigned against them. As the protesters reached an avenue leading to the Parliament, the march turned violent, with Qadri's supporters smashing windows and damaging bus stations. Police fired tear gas but could not subdue the crowds Sunday. In recent weeks, Pakistan's Islamist parties have been threatening widespread demonstration to protest what they say is Prime Minister Nawaz Sharif's leanings toward the West. They have also denounced provincial draft legislation in Punjab outlawing violence against women. Sharif also this month announced recognition of holidays celebrated by the country's minority religions, recognizing the Hindu festival of Holi and the Christian holiday of Easter.